NHS Education for Scotland (NES) is the body that has been tasked with providing training for a wide variety of professionals in Health and Social Care. The Scottish Government funded this pilot project between April 2014 and March 2015 to gain a greater understanding of the training needs of the Third Sector and to develop appropriate training to enable staff to enhance their psychological skills. The High Volume Psychological Interventions in the Third Sector project, aims to deliver an evidenced based psychological intervention within Third Sector organisations, to increase accessibility for the service users and to promote integrated working across health, social care and the Third Sector. Third sector organisation staff received Five Areas’s Living Life to the Full Train the Trainer, two day training, followed up with four coaching sessions from a Clinically Applied Psychologist. The training that is delivered is entitled Cognitive Behavioural Approaches for Wellbeing (CBA for Wellbeing). The organisations or Health Board areas who took part in the CBA for Wellbeing training from April 2015 to March 2016 were Penumbra, SAMH, Borders and Orkney. The coaching sessions have proven to increase the use of the approach following training and were received well by those who attended. The training was widely acceptable to the staff within the Third Sector and found to be suitable for use with their service users. 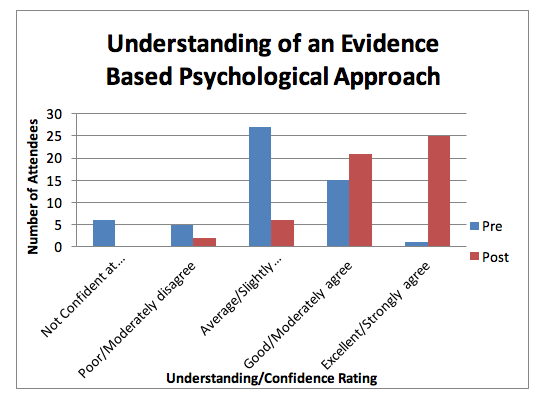 Learning Outcome 1: Please rate your/I have developed a good understanding of evidence based psychological approach. 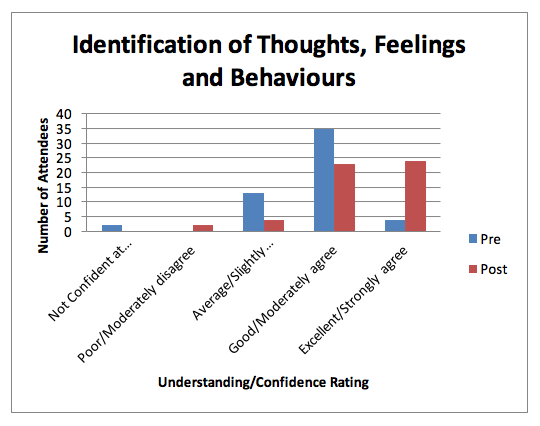 Learning Outcome 2: Please rate your ability to/I can identify thoughts, feelings, and behaviours and how they can affect people. 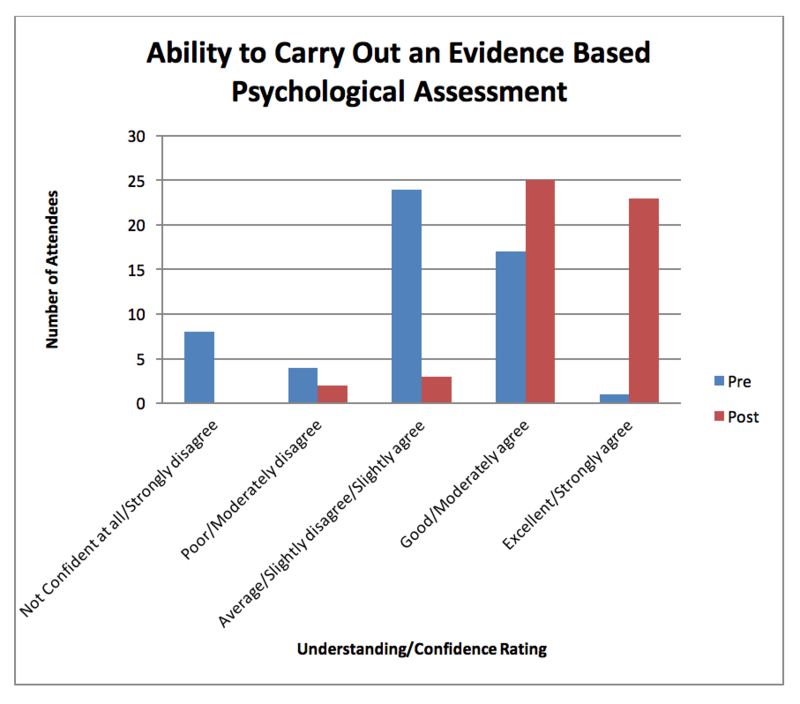 Learning Outcome 3: Please rate your ability to carry out/I have good understanding of an evidence based psychological assessment that can be used to develop an understanding of peoples’ difficulties. The CBA for Wellbeing training was highly acceptable to those who attended training. The approach was suitable for the support workers and for their client groups. The coaching promoted the use of the approach following training. The approach enhanced the relationship that the support staff had with their clients. Clients who engaged with the approach were able to make significant progress. There was clear evidence in the feedback that the model had been absorbed by both the support workers and the clients. There was an expressed desire by managers to have the training more widely available for other staff. The training in Orkney was enhanced greatly by the strong engagement of the psychology team. Orkney have now employed a Clinically Applied Psychologist with a remit within their role to continue to provide coaching sessions for those who attended the training. Some challenges were noted such as client groups from the Third Sector being more complex, lack of structure within the Third Sector to ensure goverance and little commissioning to allow time for further training and coaching sessions.